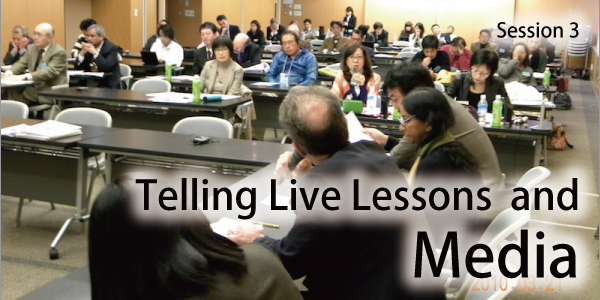 Reflecting on the significance and responsibility of mass media in implementing and or promoting Telling Live Lessons activities. Makoto Yasutomi is the Senior Editor of the Osaka Yomiuri Shinbun. 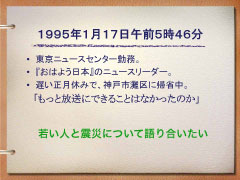 He was working as the assistant editor of the Hanshin Branch Osaka Yomiuri Shinbun when the Great Hanshin-Awaji Earhtquake struck in 1995. After that, he studied at the Disaster Reduction and Human Renovation Insitution (DRI) as a researcher from July 2005 to June 2006. He has been at his current post since July 2006. Both disaster and recovery from it live on in the stories of individual survivors. These must be pondered and preserved. But there is a dynamic tension between the need to remember and the equally urgent need to forget. A society that fails to ponder the lessons of disaster is, of course, doomed to repeat the mistakes that may have worsened its suffering. And yet, at some point the narratives central to that society's sense of itself must move beyond tales of suffering and begin to chronicle a more hopeful vision of the future. Our experience in New Orleans -- matched, I believe by the experience of Kobe and other catastrophe venues -- is that narratives of disaster and recovery are not limited to verbal accounts. Both disaster and recovery can be expressed symbolically and ritually. Kobe's wonderful earthquake museum and the festival of lights begun within a year of the disaster have been matched in New Orleans by hurricane exhibits, the restoration of our largest sports arena, the Superdome, and by the early revival of Mardi Gras, even as much of the city lay in ruins. It is interesting to note that after its most recent previous brush with disaster, the 1965 hurricane called Betsy, New Orleans erected no significant monuments in its memory. Perhaps the city was in a kind of psychological "denial". It is heartening to see that this time New Orleans is processing its grief more publicly and more fully. The Louisiana State Museum's Katrina exhibit is one indication. Artists in every medium also have focused intently on the disaster, and even homeowners have chosen to memorialize their ordeal by, for example, preserving the markings that were spray-painted onto their homes by search and rescue crews. It can only be hoped that the city's heightened awareness of disaster will eventually be translated into a fully adequate flood defense. That requires keeping alive the stories of suffering even as we collect new narratives of recovery. But so far Washington has committed only to build a substandard levee system, one that would not have repelled a direct strike by Katrina. And it is noted with disgust and dismay that Louisiana State University has fired its most high-profile hurricane expert, Dr. Ivor van Heerden, an outspoken critic of the Army Corps, the government agency that built the levee system that failed. Before he was fired, Dr. van Heerden was ordered to gag himself, lest his criticisms of the Army Corps jeopardize the university's access to federal grants. In this example we see the potency of individual disaster narratives and the need to preserve and disseminate them. Jed Horne was city editor of The Times-Picayune, New Orleans' daily newspaper, when Hurricane Katrina struck. The paper received two Pulitzer Prizes for coverage that included work written by Mr. Horne. His book Breach of Faith, Hurricane Katrina and the Near Death of a Great American City (Random House, 2006, updated paperback, 2008) was lauded on the cover of the Sunday New York Times Book Review and was declared "the best of the Katrina books" on National Public Radio. A graduate of Harvard University, Mr. Horne worked as a journalist in Boston and New York City for many years before moving south in 1988. In the early 1990s, he was a foreign correspondent, based in Latin America. Overseas reporting assignments have also taken him to Europe and Africa. After Katrina struck in 2005, Mr. Horne spent time in Kobe reporting a series of articles, honored by the American Planning Association, that drew lessons for post-Katrina New Orleans from Kobe's recovery from the 1995 earthquake. Mr. Horne has retired from daily journalism. He is at work with urban planner Dr. Edward Blakely and colleagues from Japan, Australia and the United States on a book about disaster recovery, due to be published in 2011. Mr. Horne and his wife are residents of New Orleans, where they raised two sons. 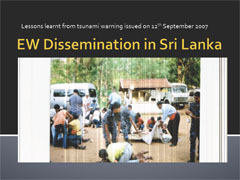 The Panos Sri Lanka office conducted and concluded in June 2008 a survey of the role of the media and community voices on the Early Warning System established in Sri Lanka after the December 2004, Indian Ocean tsunami. Sri Lanka before the tsunami did not have an early warning system. Currently there are Early Warning towers set up across the island. This survey was conducted with the aim of finding out community responses to the newly established Early Warning Systems, which looked closely on the impact of technology at village level. The other objective of the survey was to learn and discuss with the local people their own ideas and opinions for a community-based Early Warning System that can reach out at a grass ?root level. The survey was conducted by local journalists with the guidance of disaster management officers. The project was funded by the UNDP Sri Lanka office. Tokyo Correspondent: Inter Press Service. Writing assignment on Japan and Asia relations. www.ipsnews.net 2007-2010 April. Country representative, Sri Lanka office, Panos South Asia, www.panossouthasia.org Assignment: Developed and Implemented media training on globalization, democracy and community empowerment.. Projects included development of documentaries, seminars, workshops, field reporting, publications, surveys and evaluations Fund-raising. Projects were funded by international funding agencies including the UNDP Sri Lanka, ILO, Canadian International Development Agency, and HIVOS based in the Netherlands. Themes taken up for media development -- child labour natural disasters, Climate Change, local economic development, conflict and displaced population, HIV and AIDS , civil society development, minority rights and mental health. 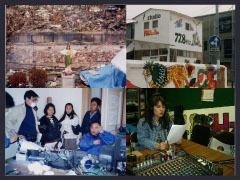 Travel and assignments covered the South Asia region Building of networks between journalists and researchers, government officials and civil society.1993-2007 -- Tokyo correspondent, Inter Press Service-www.ipsnews.net headquarters based in Rome, Italy. Asia Regional office in Bangkok, Thailand. IPS is a wire service covering the issues of the South. Assignment?News features and analysis with a special focus on development issues: regional politics concentrating on Japan-Asia relations, economy, environment, human rights, development economics, gender and society.